You are here: Learning Center » Mortgage Market Acumen » How Does Slow Lending Affect You? We all knows that banks have been giving out loans much slower in the last few years than they have before. But have we considered the domino effect of this slowdown, other than the obvious? Over the past few years, bank lending has been through somewhat of a roller coaster ride. When looking further back to when the Federal Reserve began collecting these types of statistics, bank loans have never seen a drop like that seen in 2008 (perhaps because the data set only dates back to 1947, a good 20 years after the Great Depression began). This is shown graphically in the following graph, where the orange line represents overall commercial bank loans and leases on their balance sheets. 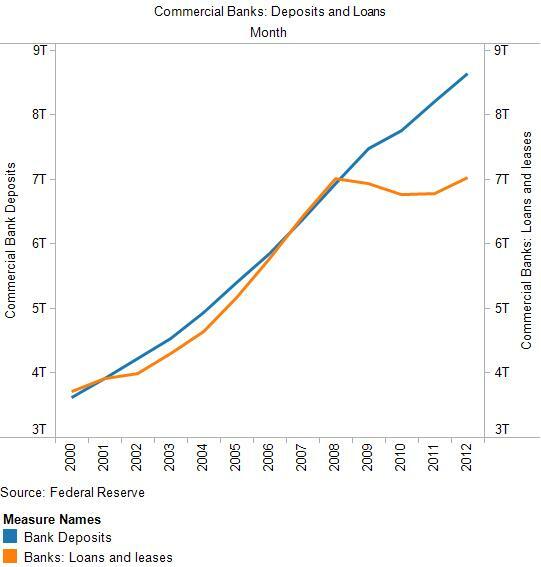 Overall, bank lending has historically kept pace with overall growth in deposits. The relationship broke down in 2008, when the global financial crisis struck fear in the mind of most financially minded professionals. The deterioration in the relationship among bank deposits and bank loans according to the periods 2000 to 2007 and 2008 to 2012 is shown in the following two charts. The first chart, showing the years 2000 to 2007, shows the strong positive correlation among the two, whereas the second chart, covering the years 2008 to 2012, shows no relationship at best, with a slight downward bent in the overall relationship. Why the breakdown in the relationship? More than likely, one big culprit is banks’ concern that individuals will be unable to repay their loans. This concern took root in 2008 and has not fully subsided. The difference between commercial banks’ reported deposits and loans as of July 2012 was $1.7 trillion – that’s $1,700,000,000,000 of essentially unused cash the banks are sitting on but unwilling or unable to lend! Unfortunately, regulatory hurdles being added regularly by government agencies don’t make it easier for banks and mortgage companies to lend more money. That, however, is a topic for another article. The current situation begs the question – what are you missing because of banks’ general risk adverse behavior to expanding their loan portfolios and certain individuals’ lack of desire to ask for what might be considered risky loans? Well, this $1.7 trillion question depends on what the money would be used for. These in turn depend upon a number of interrelated factors, such as expected profit from a loan, product demand of the business the loan would support, an individual’s anticipated ability to pay back a home loan, uncertainty over the economic outlook, desired savings levels, preferred mobility levels, and expected consumption, among many others . Although the uses of the $1.7 trillion could be very broad with a good deal of uncertainty over how businesses and individuals may use the funds, one can analyze what might happen assuming various historical relationships with lending hold. For instance, we can estimate the multiplier effect of a home purchase on the broader economy by estimating the effect a home purchase has on home furnishings and home remodeling businesses. So, what would $1.7 trillion in additional lending do to the economy overall and perhaps for your pocket book? There would also be a good deal of employment gain. In analyzing various scenarios, the middle of the road estimate comes out to be 18 million additional jobs. How big of an increase are 18 million jobs? Pretty big, considering that the economy right now has about 133 million non-farm jobs and businesses are struggling to create 100,000 jobs in a month (1.2 million on an annual basis). An increase of 18 million jobs (or 14% increase in the overall jobs count estimate) would cover all of the current 12 million unemployed in addition to the estimated 5 million workers that gave up looking for work and are therefore not counted as unemployed. Would $1.7 trillion in additional lending, an increase of 25% over the current annual trend level of $7.1 trillion, really create 18 million jobs? Maybe; but one thing is for sure – it would create jobs in such industries as banking and credit, insurance, and building, home, and garden. If you’re already employed, you’d likely get a raise of a few percentage points above inflation in the initial year. If you’re not employed, you’d likely be able to find a job much more easily. If you’re a home buyer, you’d be able to get a loan more easily because of the supply of credit as well as your increased expected income. If you’re an existing home owner, you’d probably see your home value increase faster than inflation, at least in the initial years. Overall, the $1.7 trillion difference between bank deposits and loans is something that could really affect your pocket book depending upon how it ends up being used. It’s something worth watching.